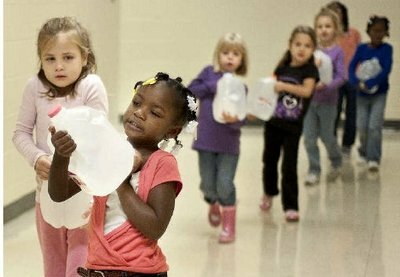 How do you teach little children about the water crisis? Our new friends at the Bunche Montessori Early Childhood Center had a fantastic idea… Why not have the children experience what it might be like to gather their own water every day? So, for the past couple of weeks, that’s exactly what they did. Each morning students had the opportunity to struggle with a gallon of water, hauled in from a tap outside their classroom. It’s a lesson they won’t soon forget. Children, not much older then themselves, carry out this same chore day after day in countries like Uganda and Sierra Leone. Of course, there is no tap outside their classroom. Instead the trek is often miles, and the water they eventually fetch is rarely clean or safe. 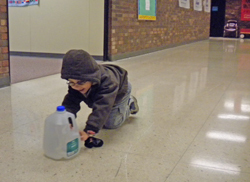 This little guy couldn't quite manage to carry a whole gallon, but he was determined to take part! The students at Bunche spent a month learning about these truths while they raised funds to help build a water project. Each of them got personally involved and quite literally carried the burdens of another. In doing so they learned just how much their help truly matters. Now, thanks to these students, life will soon be changing for students just like them at one school in Sierra Leone. The money they have raised will be used to repair a broken down well. Hundreds of students will then have access to clean, safe water right outside their classroom, just like the students at Bunche. We’re so proud of their hard work! And we can’t wait to show everyone who participated the actual well they helped fund.